The finance sector has the capacity to enrich and reward the lives of many. The wealth it has helped generate has played a vital part in the decline in global poverty over the past 30 years. 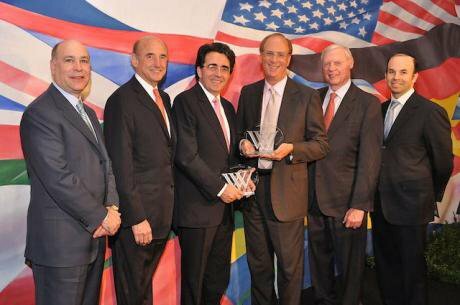 CEO Larry Fink ( third from right),at Wilson Awards, Wilson Centre, 2010. Wikicommons/ Some rights reserved. The most remarkable thing about financier BlackRock CEO Larry Fink’s latest letter exhorting corporate captains to develop a “social conscience” was not the media’s excited response – the NY Times called it “Wall Street’s watershed moment,” and Le Monde, an “ ‘inflexion majeure’ ” in the evolution of capitalism. No, what was remarkable was that it was news at all. Granted BlackRock – the world largest asset holder – owns a staggering 8% worth of the S&P 500 companies, so what Mr Fink says is always worth listening to. But is not his message precisely what all financiers and asset managers ought to be demanding all of the time from the businesses they invest in? More to the point, is it not precisely what the invested-in corporations ought to be delivering? Corporations must secure a reputational “social license” to operate, alongside their legal license of incorporation if they are to be commercially successful and sustainable. All investors should be demanding as much, and the rest of us should be expecting no less. Yet in terms of respect for the rule of law, let alone social responsibility, the finance sector has a lamentable record. It is not just that the sector’s political clout has managed criminal law to grey out areas that were previously manifestly illegal (such as conflicts of interest). The numbers of bank prosecutions pursued by the DOJ following the 2007/08 global financial crisis, for example, are pitiful (roughly 70 per annum) compared to those following the Savings and Loans crisis in the 1980s/90s (1,837 in 1995 alone). Nor is it that overwhelmingly those cases that are pursued are settled rather than convictions recorded (by way of so-called deferred (or non-) prosecution agreements), even when admissions of wrong-doing are extracted from errant banks. What is most reprehensible is the evident disregard banks pay to the consequences of their actions. The size of settlements in many of these cases are eye-watering. BNP paid $8.9bn (for violating trade sanctions); Credit Suisse, $2.6bn (facilitating tax evasion); and HSBC, $1.9bn (money-laundering). And yet they do not seem to have the desired deterrent effect. Recidivism is rife. JP Morgan Chase coughed up a total of $40.1bn from 26 cases between 2008 and 2015, and Bank of America a total of $77.1bn from 34 cases in the same period. These settlement sums have become mere costs of doing business, to be passed on, ultimately, to clients and customers. Some settlements are even tax-deductable! These settlement sums have become mere costs of doing business, to be passed on, ultimately, to clients and customers. Some settlements are even tax-deductable! So in lecturing Corporate America, titans of finance need to be sure that they are also putting their own house in order. Banks and other financial institutions still struggle to come to terms even with the relevancy of the language of human rights to their operations. A 2017 discussion paper from one group of leading European banks (The Thun Group), distances financiers from any responsibility for human rights abuses of their clients unless the bank’s funding is “directly linked” to the rights-abusing action (a high bar indeed given the fungibility of finance). This, at the same time as corporations in other major sectors like retail and extractive industries are increasingly acknowledging the long reach of their supply chain responsibilities. Meanwhile, the still new Banking Standards Board in the UK continues its Sisyphean task of reorienting the sector’s moral compass and the ongoing Banking Royal Commission in Australia offers up a cavalcade of financiers’ misdeeds on an almost daily basis, albeit to a public seemingly resigned to the gutter ethics on show. Yet, the finance sector has the capacity to enrich and reward the lives of many. The wealth it has helped generate has played a vital part in the decline in global poverty over the past 30 years (albeit that still some 760 million people live in abject poverty); poor countries’ economies have expanded, some spectacularly (albeit with manifest inequities in it distribution); and in the widening access to financial services through micro-financing and mobile money via the ubiquity of cell phones in developing countries today, no matter the extortionate fees and rates charged by the lenders. Further, the many instances of skulduggery within finance seem to be more products of prevailing banking culture rather than something innate to the sector. Finance’s Darwinian incentive structures relating to pay, promotion and respect create cheats rather than attract them, as multiple studies have shown. So if the incentives are changed, behaviour will follow. It is here that the sentiment behind Mr Fink’s letter gains traction. It is volunteered from within the sector; not imposed from without. It challenges the status quo of finance’s exceptionalist claims to be unhindered in its pursuit of profit (the ‘golden goose’ syndrome), and it confronts finance’s entrenched political power (the revolving door between finance and government). The acid test, of course, is whether BlackRock specifically, and the sector generally, walk the talk. They can (as illustrated by the uptake in social impact investing by mainstream financial firms such as Goldman Sachs and JP Morgan, as well as BlackRock), and they should. For the message for finance is one that points the way back to the future, not to iconoclasm.